We first worked with Agatha & Louise on their initial e-commerce shop in 2007. The web and e-commerce has changed drastically since then, as mobile devices have gone from early adopters to widespread everyday use; in 2014, it was time for a major overhaul. Agatha & Louise came to us to launch their site on a new technology platform that would give them all of the baseline e-commerce features expected today and would support their growth and marketing needs for the coming years. The site was migrated to the new platform at BigCommerce, which includes thousands of products, categories, and related data. The Agatha & Louise brand is classic and sophisticated with a dash of whimsy, a feeling which had to be preserved, but also updated to match current technology and visual trends. We accomplished this by keeping many of the same brand elements – colors, fonts, and graphics. We made the site wider, giving everything more breathing room and establishing a strong hierarchy of text headings. We also recommended ways to include more flexible merchandising space on the homepage. 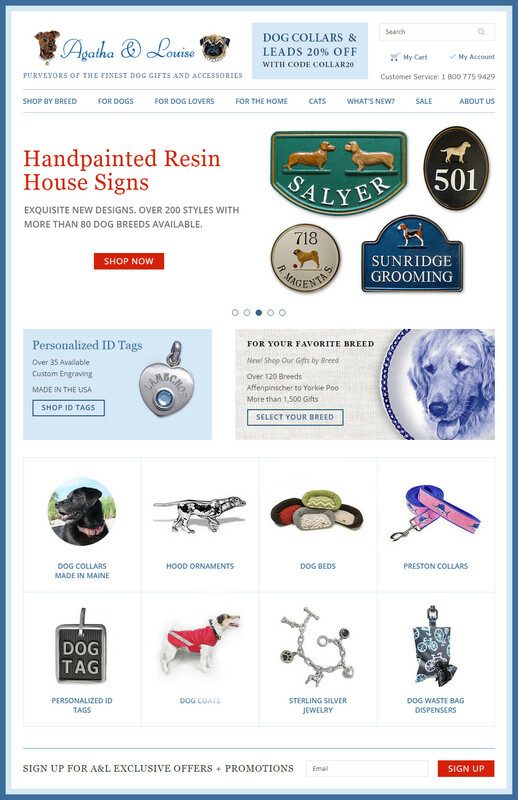 Dog lovers at their core, Agatha & Louise customers on the old website frequently searched by specific breeds, so for the new site, we developed a search by breed tool and featured it prominently on the homepage. We also worked to enhance calls to action and refine the checkout process to maximize conversions. While the site was being brought over to the new platform, it was the perfect opportunity to update it to adapt to any size screen. The entire site is now responsive to offer the best experience possible to users on mobile devices and tablets. With the ever increasing amount of mobile traffic most sites are currently seeing, this was an important step to support the long term sustainability of the site. Overall, the refreshed site offers Agatha & Louise more promotional and SEO control, an updated look and feel, and key e-commerce features to continue growing the business. How can we help? Let us know what you have in mind. Altolus is a design company. We are a full service interactive agency driven by executing beautiful and effective experiences. We believe in user centered design, data based decision making and delivering exceptional value to our clients. Whether you need to grow your brand, sell a product or tell a story, we are here to help. ©2019. ALTOLUS IS A REGISTERED TRADEMARK.